No, this isn’t my attempt at a Who’s on First (who could compete with Abbott and Costello?). Quite simply, if you don’t know why you are doing something you are bound to be less effective, sometimes way less effective, sometimes even disastrously less so. Purpose is about much more than producing profits. If you get your purpose right, and execute well and strategically, your profits are likely to follow, and be much more sustainable. Purpose (Why) is doubly important in CSR and Sustainability. The Why connects business, social and environmental impact – not one at the expense of the other. It connects them synergistically, so there is more of each. Why is it important for key stakeholders (internal and external)? Why is it important for the planet? Go through these questions. Do it alone. Do it in a group. Do it with key stakeholders. Even do it with someone who knows nothing about your project to make sure you understand it well enough to answer their questions in simple terms. When business is solid on the Why, it is ready to move on the How and What. When you, as a leader, know your why, the what and the how will flow easily. Your team will follow and results will happen. 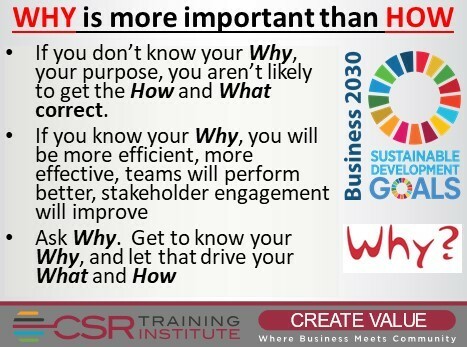 When you know your why the how and what of impact measurement, program management and communications and reporting. will be clearer. When you know your why, your engagement with stakeholders will be much easier. And better. Only when you know your why you are ready to start working on what you will do and how you will do it. Not before. I was recently meeting with a client who had been spending a lot of money constructing community health clinics and school facilities around their operations. They had asked me to help them become more efficient at converting CSR budget to business value. When we looked at their budget line items and started to ask Why, it became evident that their budgets had been allocated in response to stated priorities from local stakeholders who told them what they wanted. Seemed that nobody had asked why. The why of doing it wasn’t addressed. Because they responded to a what, the focus was on constructing the facilities and doing it on time and budget. Nobody was asking why. When we started to dig into the why, everyone realized that the real reason was to improve healthcare and education, along with the follow-on impacts that come from that. As we went deeper into how to achieve the why, the company realized that for years its CSR and Sustainability focus had been on capital projects, on responding to what local stakeholders said they wanted; new buildings and new facilities. When they were built the community and the company both checked them off their list. And local frustration continued because, even with new facilities, healthcare and education outcomes were not improving as they had hoped. Once we understood the why it became clear that we could achieve better impact, better results, and with LESS MONEY. When we knew the why, it was evident that we had been tracking the wrong things. Project success was much more than completing facilities on time and on budget. Project success included delivering on the why. 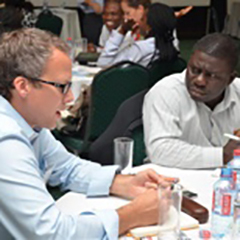 When we started to facilitate the why discussions stakeholder relations improved. Impact improved (including SDG impact). And the relationship between budget and value improved.